The sun’s rays get in, but the heat stays outside at this Taco Bell..
After a bike ride when the temperature is in the 90s, I am grateful for any oasis that is crisp, clean and above all cool. 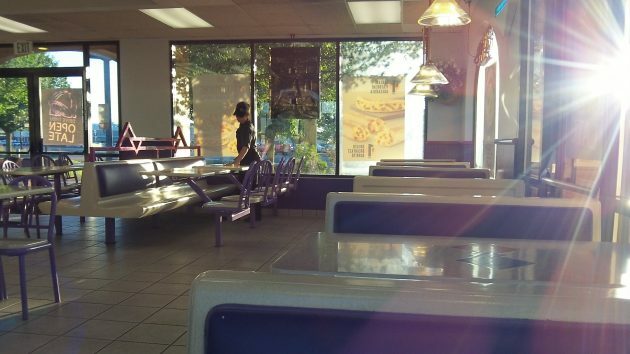 So about an hour before sunset on Thursday, I landed at Taco Bell on Southwest Pacific. The crowd was gone. Except for a staff member wiping tables, I had the cool air in the seating area all to myself. And I was thinking about how great an invention refrigerated air conditioning is. The graph explains itself. 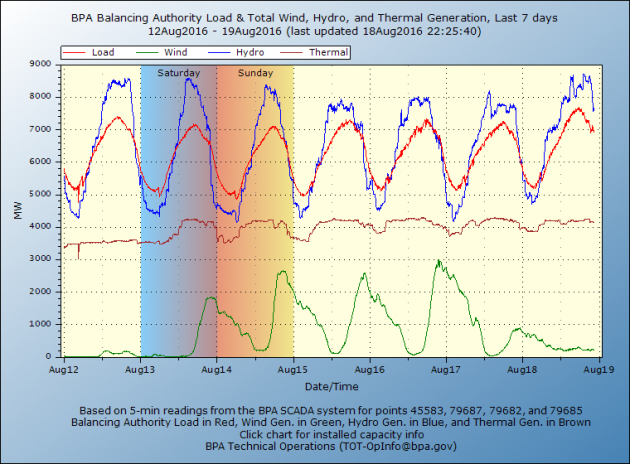 Last Friday and Saturday, when it was hot in Oregon, hydro and thermal power sources, including coal, were going like gangbusters and keeping the juice flowing around the BPA system. What about wind? What wind, you might ask. The wind died those days, and the various windmill farms did nothing to help. Thursday was another hot day, with air conditioners humming away not just at my friendly Taco Bell but everywhere else. And again, hardly any contribution from wind. If it weren’t for the hydro dams and the thermal plants feeding the Northwest, we’d probably be having brownouts and suffering in the heat. The problem is that without thermal generation, which means coal, gas or nuclear, our energy picture would be bleak indeed. That’s because on days when the weather makes electricity even more necessary than usual, it’s common for the winds to die down. Unless this policy is reversed with the election of different leaders at the state and federal levels — and there’s no sign of that — there will come a time when during heat waves or other times of heavy electricity demand, air conditioning will not be an option. And during the winter neither will electric heat. The “load” line is the cyclical red line near that peaks just below the hydro. I recently visited Powerhouse #2 at Bonneville Dam. It was truly impressive to tour. It was clean, fairly quiet, and produces tons of power. Not only do dams produce power, they aid in flood control and irrigation. They allow for more water recreation. They last a long time and provide jobs. And great lengths are taken to minimize the environmental impact. Way to go, hydro! Yes, Hasso….the sky is falling, just as you describe it. In the near future, air-conditioning will be but a memory. American know-how will come up short. Just ask Chicken Little. But Hasso seems unconcerned about the long term effects of doing nothing about climate change, the usual motif for Reactionaries. If what we’ve done in the past worked, then making any attempt to change, to preserve our air-conditioning heritage, is futile. That humankind should make an attempt at saving the planet, even though doing so MIGHT cause Hering to break a sweat occasionally, seems to go against the Reactionary grain. Who knows? Perhaps Taco Bell will go out of existence as air conditioning fails due to inactive, non-spinning wind turbines, non-flowing rivers and other such catastrophes. perhaps it is time for Hasso to explore a different angle. Or, perhaps….just maybe, Taco Bell is the problem….all those electrical appliances grinding out mediocre Mexican even as the planet boils. Thank you Hasso for the graph. I don´t know how anyone could argue over your research. But I´m sure some others will have interesting comments. I can’t recall a situation in which either the D’s or R’s suggested removal of Bonneville Dam. The graph reads different to me when you look at the whole time-frame shown. It appears the load stayed relatively consistent throughout and there was considerable wind power contribution on the 14-17 (inclusive). I see no problems as outlined. Now, if we had very consistent high temps over a long time frame – possibly a connection could be made. Too little data in info supplied to be concerned IMO. And those are the days we should be taking full advantage of the solar energy that is available. That is, on the days our sky isn’t whited out with Solar Radiation Management techniques. Google it, learn more. Do some sky watching, you’ll be dismayed when you figure it out, so maybe it’s best (for some) to keep the head down and the eyes wide shut. The idea is to transition to where thermal power is used for peak power generation, not base load. The problem being worked on is how to store non-thermal power generation so that it is less variable. It’s not an easy solution. Gravity has been used to store energy for a long time, but so far it’s not too practical for large scale operations. I know in Arizona they used to pump water from chained lakes back uphill overnight, so they could reuse the water for daily production. I seem to remember that they quit that as the demand for the water itself exceeded the supply. Elon Musk wants to put battery systems in homes all across the country that would store power from a home solar system, or overnight from public power, that can be used to supplement peak needs. They are now on sale, but not cheap, yet. As with everything else, mass production lowers unit costs. Musk has been thinking out of the box. We all should. We have ton understand that an electrical grid essentially has no storage capacity. If demand exceeds supply, somebody goes dark. If supply exceeds demand, generation has to back off virtually immediately. When we only had two production components (hydro and thermal), hydro could be shifted slowly while thermal responded to load. The addition of wind has complicated grid management. There are several periods of high water flow and high wind. It’s not currently feasible to swing thermal at a high enough rate because the plants can’t swing that deeply. Having said all that, Bob’s point about power storage is correct. Batteries are a currently-available technology, but not likely a long-term solution. Pumped storage ( water or air) has high capacity but high losses as well. Maybe Tesla had some good ideas after all. 1 – On the supply side, solar is probably better than wind because predictability is better and because it’s cost is dropping faster than wind. 2 – The demand side can help a lot by using strong pricing incentives (smart meters). 3 – If my understanding is correct, gas is much easier to switch on/off quickly than coal or nuclear. Nuclear doesn’t swing well or turn do very far. There’s a lot of mass that holds a lot of heat. Coal is a little better, but the plants were designed to run hard with small turndown. HH ran a piece about rapid-start gas turbines with HRSGs behind them. These are smaller units that can swing and drop off quickly. Group a bunch of them together and you have real power station. A plus side is that these plants don’t have to find a place for mountains of ash. To me, the problem with AC (at least around here) is the same as the problem with cars everywhere. It would be nice to have them once in a while (a very long while in the case of AC). But if I owned either, I would use them more than I needed. or even wanted. I would grow fat, lazy, and uncomfortable in the natural world. If I didn’t use them often, I would feel very foolish for not getting my money’s worth. So, I live in partial voluntary poverty. I’ll bet there are many people with similar dilemmas who reject parts of the dominant narrative of the American good life. And then there are those of us that can’t afford AC and have to use fans AFTER the sun goes down. So much for solar. BTW- Batteries do have a service life and can’t be considered “clean” when it comes to recycling their toxic components. Once out of sight, out of mind and people feel “green”. Don’t be stupid. Anything can be recycled. It’s a resource. I wonder if we can recycle the hot air and drivel which so often spews from your mouth? Don’t call people stupid, it’s not polite.